. . . Shoreditch is a district northeast of London with many industrial and picturesque streets that remains are a constantly changing environment. The galleries are besieged the old warehouses and brick number of creative, like "street artist" Banksy, regularly draw their inspiration. Shoreditch draws its creativity from its rough walls multifaceted and wild energy emanating from its unusual places. The design of the MINI Edition Shoreditch is inspired by the soul of this unique neighborhood. Offered exclusively in France on the MINI 3 and 5-door engines in One, One D, Cooper and Cooper D, she joined the private club MINI special editions and could quickly become a "collector". Outside, the MINI Shoreditch Edition is distinguished by its twin parallel bands hood and trunk in a shade "brick" with patterns recalling the chevron own tone to the ambiance of the neighborhood. 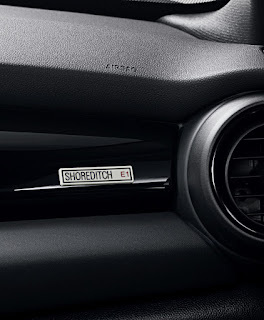 Profile, a badge "Shoreditch" recalling the signs of the London streets is integrated with the door pillars. It is also found inside the passenger side decorative insert. . . .